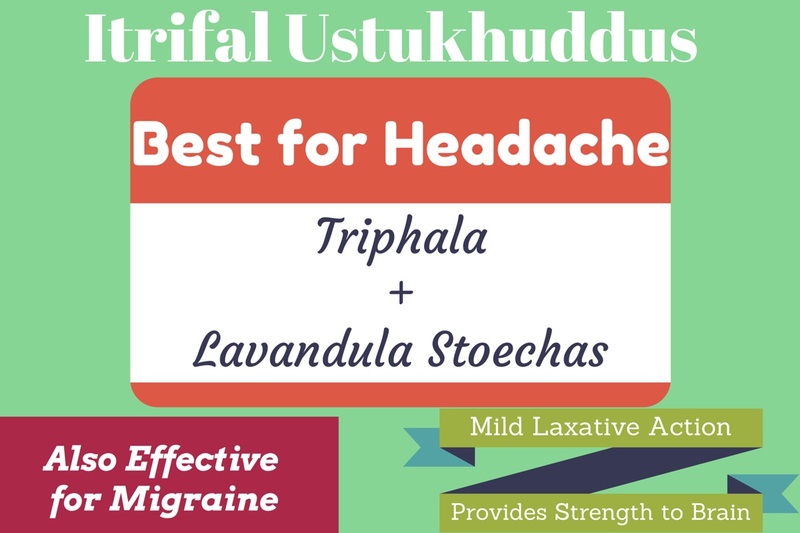 Itrifal Ustukhuddus is a Unani medicine that has potential health benefits in headache and useful in migraine. This formulation contains Triphala and Ustukhuddus as main ingredients. Ustukhuddus has beneficial effects on brain and nerves and Triphala acts as detoxifier and helps in digestive ailments. Itrifal Ustukhuddus is mainly brain tonic, provides strength to brain, and prevents nervine disorders. Due to Triphala, it is beneficial for constipation as well. The main action of Itrifal Ustukhuddus is on brain and intestines. It provides strength to the brain and intestines. It is therapeutically used in following diseases. Ustukhuddus (Lavandula Stoechas) and Almond Oil has MEDHYA effects, which means increase strength of the brain and acts as brain tonic. The formulation is prepared according to three points of views. Generally, headache occurs due to over activities of brain structures, which are pain sensitive. Lavandula Stoechas helps reducing the over activities of pain sensitive areas of the brain. Lavandula Stoechas also reduces irritation of trigeminal nerve, which is also cause for migraine headache or trigeminal neuralgia. The second cause of headache is illness of ill health of alimentary canal including stomach and intestines. Now, three factors play a role in this. Rosa Damascena flower, Amla and raisins reduce acidity and provide relief from headache associated with hyperacidity or gastric diseases. Ustukhuddus, almond oil, honey and Triphala herbs reduces gas formation in the abdomen. These herbs help in abdominal distention, intestinal gas and cramps. Triphala also treats constipation, which is also a significant cause of headache. Due to all these functions, Itrifal Ustukhuddus becomes a good remedy for headache. It helps in all following symptoms linked with headache and migraine. Itrifal Ustukhuddus has anti-inflammatory, antiviral and antimicrobial properties. It reduces symptoms of Chronic Catarrh. Generally, Chronic Catarrh occurs after hay fever or common cold and characterized by nasal congestion and mucus build up in the nose, throat or chest. Itrifal Ustukhuddus reduces the mucus secretion and congestion, which gives relief from all symptoms of catarrh. It may not be effective if catarrh occurs due to nasal polyps. Chronic catarrh, stress, vitamin deficiency, chronic constipation, anaemia, etc are common causes of premature greying of hair. Itrifal Ustukhuddus contains herbs, which naturally treat nutritional deficiencies and reduces chronic constipation. Therefore, it is effective for premature whitening of hair. The mild laxative action of Itrifal Ustukhuddus is due to Triphala and three types of Haritaki used in the formulations. Raisins, almond oil and rose flowers also help reducing constipation. Itrifal Ustukhuddus is effective for mild constipation. Note: One should take Itrifal Ustukhuddus once a day preferably at bedtime. Itrifal Ustukhuddus contains Terminalia Chebula, which is not a suitable herb in pregnancy. Therefore, it is UNSAFE in Pregnancy. Itrifal Ustukhuddus is POSSIBLY SAFE during lactation if taken under the supervision of Unani or ayurvedic physician. Itrifal Ustukhuddus is POSSIBLY SAFE for children. There are no adverse effects reported in children while using it. Itrifal Ustukhuddus have following contraindications. I am pre diabetic and have stomach problem as well sinus issues. Can I use itrifal ustukhuddus? There should be no problem taking Itrifal Ustukhuddus in pre-diabetes. Just you need to check the blood sugar level on regular basis. Is it suitable in diabetes? Itrifal Ustukhuddus can be taken in diabetes if it is under good control. Is it useful for prevent hair fall? Yes, Itrifal Ustukhuddus prevents hair fall and promotes hair growth. If I eat some specific food I get stomach issues. Can I use itrifal ustukhuddus? Please consult ayurvedic or Unani Physician. Can it be used with homeopathic tonic alfalfa? Yes, Itrifal Ustukhuddus can be used along with alfalfa tonic. I always get headache on the left side of head after eating food for last 4 months. Can I use Ustukhuddus only? Does it help? While taking any unani medicines or itrifal ustukhuddus, can we use apple cider vinegar because I use it daily diluted in water. Should I stop, or can I continue? You can continue both keeping 3 hours gap between both. It is useful for stopping white hair.